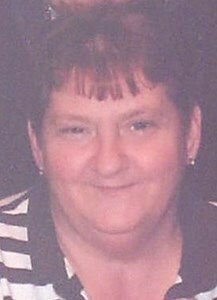 Violet Leyland, 60, of Syracuse passed away on Tuesday at Francis House surrounded by her family. Violet was born on January 28, 1958 in Massena, NY, the daughter of the late Joseph and Verna Plourde. Violet enjoyed spending time with family, especially her grandchildren. She was predeceased by her husband, William Leyland. Violet is survived by her children; Tina(Josh) Rozner, Stephen (Jordan) Leyland, Scott (Cortney) Leyland, grandchildren, Brandon, Nathan, Alec, Shannen, Payton, McKenzie, Nicholas, Lexi, sisters, Yvonne (Tom) Clarke, Annette Clarke, brothers, John (Betty) Plourde, James Plourde, Leon Plourde, Richard Plourde, Alfred Plourde, George (Delores) Plourde, along with many nieces and nephews. Calling hours will be held at on Saturday, December 1, from 1-4 pm at New Comer Cremations & Funerals, 705 N. Main St., N. Syracuse, with services at 4pm. The family would like to thank Francis House and Hospice of CNY. In lieu of flowers donations may be made to Francis House. To share a memory of Violet, or leave a special message for the family, please click the Share Memories button above. Add your memories to the guest book of Violet Leyland. I will miss her dearly. She was my closest Aunt both in age and understanding. I may not have been able to see her in a few years, but she was always close in my heart. Love and prayers to Scott ,Tina ,and Steve. Hope everyone who passed before her are wrapping her in love in heaven. God bless my cousins and may my aunt have beautiful wings in heaven. Scincères symphathies à toute la famille Plourde ainsi qu'à tous les proches de Violet. Je suis en pensées avec vous tous en ces moments pénibles. Que Dieu vous bénissent. Violet was a funny lady. I worked with her husband bill for 6 years. She’s at peace now n with her loving husband. She will be miss.